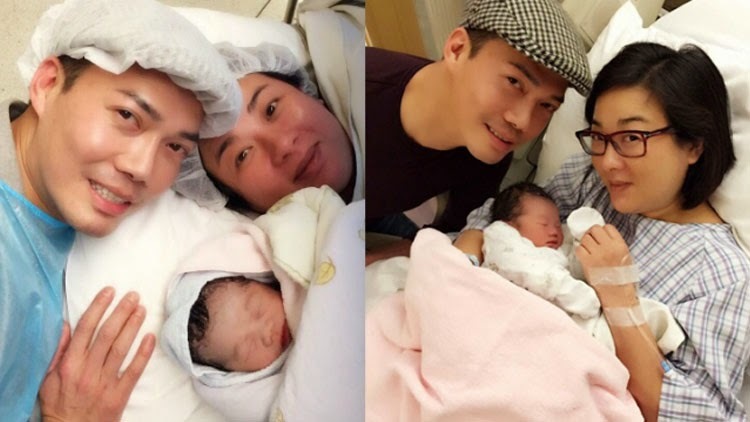 In recent days, TVB's variety program "Scoop(東張西望)" helped Michael Tse(謝天華) and wife Tina Lee(李天恩) announce the birth of their son to the world. Yesterday, Michael posted his son's pictures onto Weibo and shared his feeling about becoming a dad. While we can see that the baby boy "Tse Ho Fei(謝浩飛)" is doing great but we didn't have a chance to see how the new mom is doing. So today, Michael posted an adorable picture of the family of three snuggling and looking up at the camera. In the picture, Tina is seen wearing glasses and looking great. In another picture, Michael is seen wearing an operation room cap while snuggling the baby by the bed. It is believed that picture was taken right after she gave birth. While in another picture, you can see that little Ho Fei already has an English name called "Theo". Selina Jen(任家萱)'s Husband Zhang Cheng Zhong(張承中) Rumored To Have Cheated With a 22YO Model?